Boeing and Embraer have confirmed plans to establish a joint-venture that aims to boost their competitive offering in the commercial aircraft sector. Under the Memorandum of Understanding (MoU) announced on Thursday (US time), Boeing will purchase 80 per cent of Embraer’s commercial aircraft and services business for US$3.8 billion. Meanwhile, Embraer will have a 20 per cent stake in the new JV. The deal, following months of negotiations, valued Embraer’s commercial aircraft operations at US$4.75 billion. Embraer chief executive Paulo Cesar de Souza e Silva said the agreement with Boeing would “create the most important strategic partnership in the aerospace industry, strengthening both companies’ leadership in the global market”. “The business combination with Boeing is expected to create a virtuous cycle for the Brazilian aerospace industry, increasing its sales potential, production, creating jobs and income, investments and exports, and in doing so, adding more value to customers, shareholders and employees,” de Souza e Silva said in a statement. Boeing chief executive Dennis Muilenburg added the strategic partnership meant both companies would be “really positioned to generate significant value for both companies’ customers, employees and shareholders – and for Brazil and the United States”. “This important partnership clearly aligns with Boeing’s long-term strategy of investing in organic growth and returning value to shareholders, complemented by strategic arrangements that enhance and accelerate our growth plans,” Muilenburg said. The joint statement said the partnership was a natural evolution of a long-standing history of collaboration between Boeing and Embraer over that past two decades. The new JV would be led by Brazil-based management, including a president and chief executive. Boeing would have operational and management control of the new company. “Boeing and Embraer will benefit from a broader scale, resources and footprint, including global supply chain, sales and marketing, and services network, which will enable them to capture benefits from best-in-class efficiencies across the organizations,” the statement said. The parties said the proposed transaction was expected to close at the end of 2019 and was subject to shareholder and regulatory approval. It also required the green light from the Brazil government. 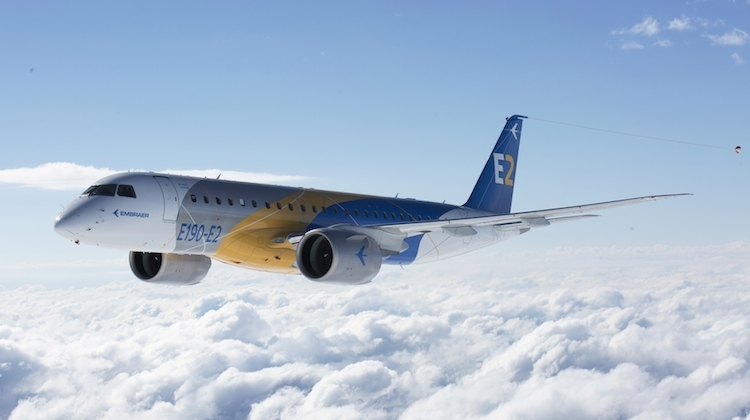 Embraer’s E-jet family of aircraft includes the in-service E190-E2 (97-114 seats), as well as the E195-E2 (120-144 seats) and E175-E2 (80-90 seats) which are due to enter service in 2019 and 2021, respectively. There is also the current generation E170, E175, E190 and E195 E-jet variants. VIDEO: A look at the delivery of the first E190-E2 to Wideroe in April 2018, as shown on Embraer’s YouTube channel. The E-jet line-up compliments Boeing’s 737 narrobody family of aircraft that begins with the smallest variant the MAX 7 (138-153 seats) and stretches all the way up to the 737 MAX 10 (188-204 seats). VIDEO: Boeing’s narrowbody lineup includes the 737 MAX 7, which made its first flight in March 2018, as shown in this video from the Boeing website. The coming together of Boeing and Embraer followed Airbus acquiring a majority stake in the C Series program. Under the terms of the deal, which was first announced in October 2017 and closed in early July, Airbus holds a 50.1 per cent stake in the C Series Aircraft Limited Partnership (CSALP), with Bombardier to hold 31 per cent and Investissement Québec (IQ) 19 per cent. The C Series features two variants – the CS100 designed to seat 110 passengers in a single-class configuration and the larger CS300 which is configured for 135 passengers, based on 32in seat pitch. These two aircraft are already appearing on the Airbus website. Powered by Pratt and Whitney’s PW1500G geared turbofan, the C Series competes for the lower end of the narrowbody market alongside the Embraer E-jets and Mitsubishi Regional Jet, and to a lesser degree designs from Sukhoi and COMAC. VIDEO: Swiss was the launch customer of the C Series. This video from Bombardier’s YouTube channel shows a CS300 being painted in the airline’s livery. In this part of the world, Qantas operates the Boeing 717, 737, 767 (freighter only), 747 and 787, while Virgin Australia has the 737 and 777 in its fleet. Other Boeing operators include Air New Zealand (777, 787) and Fiji Airways (737). Meanwhile, Australian regional carrier Airnorth has both the Embraer E170 and E120 in its fleet. Virgin Australia did previously fly E170s and E190s but stopped flying Embraer aircraft in February 2018. And regional carrier Jetgo has ERJ-135LRs and ERJ-145LRs. However, it suspended all regular public transport (RPT) flying on June 1 after being placed in voluntary administration. Some charter flights are still operating. Meanwhile, the two companies also announced plans to establish a separate JV to “promote and develop new markets and applications for defense products and services, especially the KC-390 multi-mission aircraft, based on jointly-identified opportunities”. 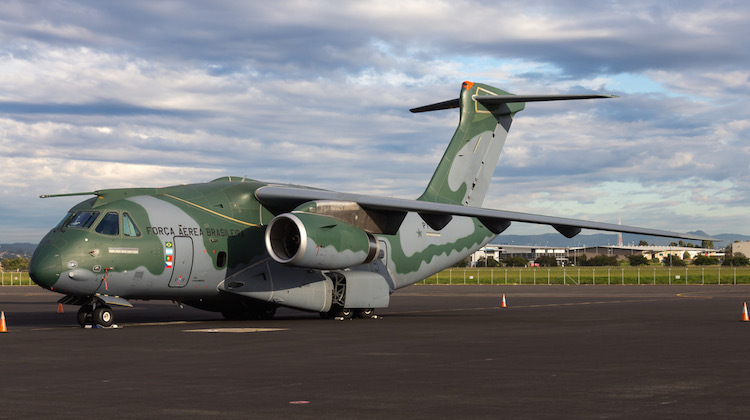 “Joint investments in the global marketing of the KC-390, as well as a series of specific agreements in the fields of engineering, research and development and the supply chain, will enhance mutual benefits and further enhance the competitiveness of Boeing and Embraer,” Embraer executive vice president for financial and investor relations Nelson Salgado said. Boeing had previously worked with Embraer on the KC-390, including sharing technical knowledge. Further, the pair announced at the 2016 Farnborough Airshow an agreement to jointly market the aircraft. The aircraft is currently in flight test, with first delivery to the Brazil air force expected by the end of calendar 2018. Further, it is under consideration by the Royal New Zealand Air Force to replace its five C-130 Hercules. The December 2017 edition of Australian Aviation features an in-depth look at the Airbus-Bombardier partnership on the C Series written by John Walton. To read more features like this, subscribe here. So in a move that surprises nobody, Boeing jumps into bed with Embraer because Airbus is sleeping with Bombardier. This is starting to sound like a daytime soapie. It is going to be interesting to see what happens. I see some interesting times between Boeing/Embraer and Airbus/C Series. I still think the C Series aircraft is much superior aircraft than the Embraer, as both passengers flight/cabin crew like the aircraft due to flight deck and cabin design especially with the large windows for the passengers. Recently had the oportunity to fly the Airnorth E170 from Toowoomba and Townsville and it was excellent – a great aircraft, a nice service, and a great size aircraft for thinner Australian routes. It reinforced that because of Australia’s unique characteristics of size and population, there are plenty of city pairs in this country that can and should be effectively serviced by smaller long-range jet aircraft. The caveat here however is that they really need to be run by airlines other than QF and VA – because their economics are basically centred on B738. Given the demise of Jetgo, one hopes that Airnorth can continue to build and strengthen. @ Ben – Hopefully the tie-up between Boeing and Embraer will continue to yield good, affordable, and economically sound aircraft – and not end up being a hasty marriage with a large dowry, a big reception, and a quickie divorce. I don’t mind the idea, it could help someone like Qantas replace their 717s/F-100s or even bring in some newer aircraft for routes. That Boeing influence could do a fair bit. In saying that I wouldn’t mind seeing a CS-100 or -300 in a Red Roo scheme. The Canadians didn’t just manage to destroy their own independent commercial jet aviation industry with the C series debacle, they’ve now taken the Brazilians with them as well. Is Embraer owned by the Brazilian goverment or subsidized by the government? That is one of Boeing’s big complaints about the C Series and an ongoing complaint about Airbus. If that it is the case it sounds like Boeing has a double standard.